Twitter Bird. 6"x 8" x 1" original painting by Nitrozac. My latest painting is of the Twitter mascot, the Twitter Bird. It's a simple little painting, one that reflects the simple service that is Twitter... 140 characters and that's it. Yet Twitter is proving to be so popular and so powerful, and recently, so everywhere. Tweets are fleeting: they are here, and then they are gone. I like to think my painting is a physical representation of those fast-forgotten virtual tweets, the one's RT'd by everyone which live a glorious life, and especially the sad little lonely tweets read by no one but their poster. It's a manifestation of all the little voices out there in Internet Land, saying their thing, regardless whether or not anyone is listening. "I'm bidding on @Nitrozac's Twitter Bird painting!" "Holy tweet! I just won @Nitrozac's Twitter Bird painting!"
. 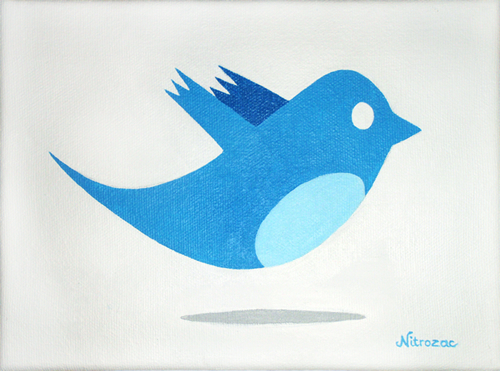 "@Nitrozac's Twitter Bird painting just arrived, and I love it!" Details: "Twitter Bird." is Nitrozac's 40th painting of her Painting Blog. It's an original painting, on 6 x 8 inch stretched canvas, with a wooden frame. The painting is about an inch thick, with painted sides, so you can frame it if you wish, or display it as is. The back of the painting contains the title, the date painted, Nitrozac's signature, and a fingerprint for authenticity. This Painting was sold! Click here to view the auction!